Indeed, our chickens lay eggs - that's why we began raising them in the first place. If you want to see how many they have laid, see the nifty egg ticker at the bottom of the sidebar on this page. This is our sixth year raising them, all total, we've collected about 4,000 in all. The 1,000th was laid on the day Madeleine was born. Since we've always had between four and six chickens at a time, we can sometimes get over two dozen eggs a week. What's with the different colors? We have several different breeds of chickens: Rhode Island Reds, Barred Plymouth Rocks, Golden Sexlinks, and Wyandottes, all of which lay brown eggs and are known for laying consistently. 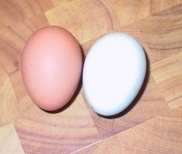 We also have one Aracana, which lays light blueish-greenish eggs. They're quite pretty. This breed is sometimes called the "Easter Egg" chicken. Chickens slow down or stop their laying with the decreased daylight hours and increased cold of the winter. Of course, this doesn't happen in factory farms, where they just keep the lights and the heat cranked up all the time. How long will they lay eggs? There is a wide variance depending on the breed, the individual chicken, and the circumstances, but the first 2-3 years are the most productive. (Factory farms kill their hens after the first one or two years). Reportedly, one granny chicken supposedly continued to lay past its 21th birthday. We do bake a lot and we enjoy them for breakfast, lunch, and dinner sometimes, although we remember to watch our cholesterol. Still, we don't eat all of them ourselves. We share them, barter them, use them as "thank you" gifts, and we try to sell enough each month -- about 3 dozen -- at $4/dozen to cover the cost of our feed.